After just reading the recipe in the technical I fell in love with this cake. I didn’t win the technical challenge on the day but I loved this cake so much I worked out how to make a version that tastes the similar to the one we made on the show back at home and best of all found a couple of ways to speed up the process. Matt’s breathtakingly beautiful original recipe can be found on lifestyle.com.au/bakeoff Check it out to see where I deviated and how close I got working from memory/researching other recipes before the Bake Off recipe was released. Matt’s recipe is definitely my favourite technical from the show and it’s become a new family favourite and regular bake. The original recipes I found to reference when I was trying to recreate were all pretty much the same as the Mary Berry version. The old-fashioned versions are nice but all the recipes I found had way too much cornflour. Matt elevates his classic recipes and refines them further by getting the perfect balance of egg and flour. His food is perfection and never tastes floury, his clafoutis recipe from the show has hardly any flour and has a silkier texture than any other clafoutis recipe I have tried since. His version of mousseline is still the best tasting one I have found. Hot tip: If you’re looking for a specific recipe or to try something new, check and see if there is a Matt Moran version first because it will be the best version that has ever existed. Matt’s not in the public conscious as a pastry chef because his savoury food is so well known and so celebrated, but he takes standards in baking to the next level. My sponge method makes a slightly lighter and less finicky cake using the same ingredients, and I skip a few steps like tempering the eggs into the milk for the mousseline, it’s not necessary if you bring the mix to temperature while stirring, it requires another couple of minutes of stirring, but speeds the overall process up a lot. This recipe makes a dessert which is surprisingly light and fresh, it gets its sweetness largely from the fruit and the marzipan. If you are not a marzipan fan, this might change your mind, it’s a thin beautiful sliver of sweet nutty deliciousness to balance the fruit. The recipe here doesn’t taste of almond essence at all, it’s really well balanced, but if you or a family member are whingers then leave the essence out and it will still taste amazing. The essence does add a depth of flavour that balances really well with the strawberry and is worth trying. Cornflour and spray cnola oil for lining the tin. Whip egg whites in a stand mixer until they start to form soft peaks, add caster sugar a quarter cup at a time whipping until the sugar dissolves after each addition. Continue mixing until all the sugar is dissolved and the egg whites have been whipped to stiff peaks. Making a meringue base first lightens this mix a lot. Melt the butter in a microwave, then set aside to cool a little, break up the egg yolks with a fork. Add zest and butter to the egg yolks and mix with the fork to combine, pour the egg yolk, butter mix into the whites and mix on high just until combined, about 2-7 seconds. Scrape down the sides and bottom to fold through any streaks of egg white. Sift the flour and baking powder together, then sift onto the meringue-like egg mixture and fold through gently with a spatula, avoid over mixing or knocking out the air, I usually just turn the mixer on for 2-3 seconds, scrape down the sides and mix it again for another 2 seconds to combine. Pour mix into the tin and spread to the sides and level off the top with a spatula, bake for approximately 25 minutes. Check the centre is cooked with a cake tester as soon as the sides begin to shrink away from the pan slightly. Take it out as soon as a cake tester skewer comes out clean. Do not open the oven in the first 20 minutes of baking or the cake will deflate. Baking time will vary greatly depending on the oven so keep a close eye on it. Let the cake cool in the tin for 5 minutes before turning out onto a cooling rack that has a sheet of baking paper over it. Allow to cool then cut the cake into two fairly even layers with a bread knife. To make cutting the cake in half easier, I find wrapping the cake in cling film and popping it in the fridge speeds the cooling, locks in the moisture and makes layering it easier. Combine all ingredients except for the butter in a medium-sized pot. Cook while constantly whisking until the custard thickens. Continue to cook while whisking until it is very, very thick, should be able to lift a heaped spoon out and have it hold its shape for a second before collapsing. Transfer the custard to the bowl of a stand mixer and mix on medium-high until the custard is cool to the touch, roughly 10 – 15 minutes. Drop in the cubed slightly soft butter and mix on high until it is incorporated, stop as soon as the butter is combined and a little bit of air has been incorporated, it should not take more than 2 or three minutes. Do not over mix or it will curdle, but it is nice to whip a little air into the mix if possible. Cover with clingfilm and place in fridge until ready to use. If the butter or custard is too warm the mousseline will curdle. It’s easier to use soft butter, but not be too soft. In summer, my kitchen is very hot so I use half room temp and half very finely diced cold butter to ensure I get the right consistency. Place the almond meal and sugar into a food processor and blitz for a couple of minutes while shaking the processor to ensure even milling, pour in the essences and process for a few seconds more, add the egg white and process until a dough ball begins to form. Tip out the dough and knead until smooth, store in a ziplock bag until ready to use. Remove the green leafy tops from the strawberries, removing as little of the strawberry as possible then wash them. Find 14-16 strawberries of roughly equal width and height, cut in half lengthways, put to one side to use as decoration around the side of the cake. Save approximately 10 strawberries to slice for decoration on the top of the cake. Dice the remaining strawberries into equal sized pieces, dicing them into eighths is usually fine, set aside to be used in the filling. Line a 9” springform tin with acetate, and place on a cake board or serving platter or use a straight-sided bottomless cake ring. I use an adjustable cake ring that resizes from 6″-12″ because I struggle to find acetate in Perth at a reasonable price. Place the top half of the cake in the ring, cut side up this will be the base of the completed cake. Brush very generously with the strawberry syrup. The syrup adds flavour, but also brings some moistness back to the sponge, so don’t be stingy with it. Arrange the halved strawberries cut side out and pointy end up around the edge of the cake ring. 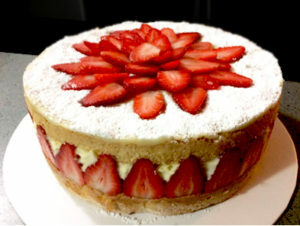 Spread just over 1/3 of the mousseline over the cake and inside the ring of strawberries. Top this layer of mousseline with the chopped strawberries then cover with most of the remaining mousseline (keep about 3 heaped tablespoons of mousseline aside). Ensure even coverage with the mousseline and that there are no air pockets between the chopped strawberries or the decorative sides. It’s a good idea to gently run a spoon through to mix the mousseline strawberry layer as it’s being assembled to an ensure even distribution of strawberries and mousseline. Paint the cut side of the remaining half cake (the bottom will now become the top) with strawberry syrup. Place the cut side down on top of the mousseline and strawberries. Spread the remaining mousseline on top in a thin, even layer. Roll out the marzipan between two pieces of baking paper, until it is big enough to cover the top of the cake. Trace out a circle to the same size and shape as the inside of the cake tin and cut the marzipan to size. Or if using a cake ring or your acetate is even at the top just peel off the paper and lay on top of the cake ring or acetate and used the edge to cut the marzipan to size. Gently press the marzipan onto the top of the cake, neatening up the edges. Place in the freezer for 15 minutes then refrigerate for half an hour before unmoulding the cake from the cake ring. Dust the top generously with icing sugar then slice and arrange the remaining strawberries on the top. Avoid getting any sugar on the strawberries or they will macerate and bleed juice all over the cake.